Posted on Thursday, May 15th, 2014 at 2:17 pm. It is not every day that you meet a meat specialist or charcutier. Especially not one with as much passion like Rachael Zavala. 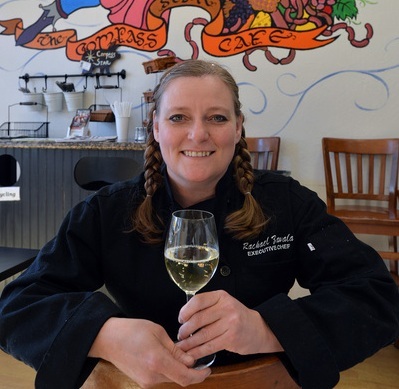 Her love for food is apparent in every house made product at her Martinez restaurant, The Compass Star. Zavala made her Taste Our Terroir debut at last year’s event, and was not afraid to be innovative with a smoked beef brisket, topped with mashed sunchokes and Mascarpone cheese served in a parmesan cone. We are excited to see what creation she will craft this year with her partners from Dante Robere Vineyards. Here we discuss Gourmet Magazines, meat and of course pairings. I’ve known since I was a little girl. My mother was a struggling single mom in the 1970’s (she had me when she was 16) working her way through college at SJ State. I was “in charge” of cooking for my little sister and brother. I was a wizard with dry goods; I could gussy up Rice a Roni like nobody’s business. One day when I was playing I found a stack of Gourmet Magazine from the late 1960’s sitting by the dumpster, all wrapped with twine like a present just for me. An avid reader, I spent that summer in my tree house fort reading about all of the luxurious foods and exotic travel destinations. By the time I was 12 I was saving babysitting money to buy spices. I was addicted, obsessed, with food. I still love and collect copies of Gourmet Magazine and held a wake at my house with close friends when they stopped the presses on the publication. Terroir is a living thing. It can taste like sunshine and smell like spring rain and pebbles, it can look like enthusiastic, disheveled rows of vines covered in leaves in riotous shades of auburn welcoming the crush… all of the million gifts Mother Nature provides to nurture and sustain any given place. The smell, the taste of the living earth. Right now my customers are really digging a pairing my Sommelier, Derek Roque put together of dry Alietico and a salad we make with a pomegranate vinaigrette. The almost fruit punch flavor of the Alietico turns into something magical when paired with these light vinaigrettes. Not every wine is food friendly and not every food is wine friendly. My sommelier and pastry chef and I will often pick the wines first and THEN create the dish to pair. I mostly drink red wine, but I have found some fantastic Rhone whites I really love. It depends on the dish! I love breakfast because it is the one meal of the day I can regularly spend with my family. Last weekend everyone chipped in for a decadent Sunday morning feast. My daughter made the waffles, I made a corned beef hash with leftover corned beef brisket from work and the left over apple and potato galette from our Saturday night Prix Fixe. We poached fresh eggs from Beetdown Pharms (Martinez) to top the hash. At home our quick fix meal is pasta with anchovies, bread crumbs, garlic, peppers and parmesan cheese. It is my family’s equivalent of Mac n Cheese. We always have the staples for this in the house. Salt! As a Charcutier, I use salt to flavor, cure and preserve.